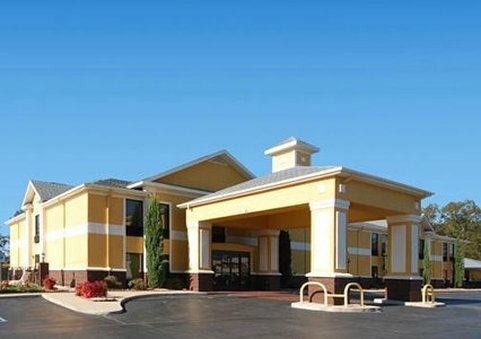 Check Rates & Availability at Quality Inn Alexander City! Get more for your money at the Quality Inn hotel in Alexander City, AL near Wind Creek State Park. This pet-friendly hotel is near destinations like Five Starr Plantation, Central Alabama Community College, Lake Martin and Charles E. Bailey Sportplex. Take advantage of amenities like free hot breakfast, seasonal outdoor pool, guest laundry, free coffee and access to copy and fax services. Guest rooms feature a flat-screen TV, refrigerator, microwave, coffee maker and hair dryer. Also, earn rewards including free nights and gift cards with our Choice Privileges Rewards program. This is a pet-friendly hotel. Pet policy, 15.00 per pet, per night. Maximum of 2 pets per room.Free Hot Breakfast.